Heidi McLaughlin works with students to have them overcome their fear of horses and to begin their journey into fearless horsemanship. Heidi’s method is a simple and effective step-by-step method that is unlike any other program. Heidi admits that she is not a trainer. “I don’t train horses, I train people and use the horse as a tool.” She adds, “I discover the source of their fears, break it down, and then build up their confidence.” Students who participate in the Fearless Riding 3-Day clinics and/or personalized Coaching Sessions will receive actionable plans that will help them to overcome their fear of riding. After a scary horse-related incident as a child, Heidi A. McLaughlin, grew up with the notion that horses were big and therefore could hurt you. This thought played over and over in her head even into adulthood when she purchased her first horse and attempted to learn to ride. She bought and sold horse after horse searching for the perfect match but didn’t yet realize that no horse on earth would ever be right for her until she first dealt with the real problem, her fear; thus beginning the long and frustrating journey into fearless horsemanship. Your journey does not have to be this way. 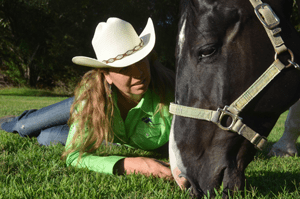 Once Heidi unlocked the secret of her own fear issues, she began helping other fearful riders with her methods. 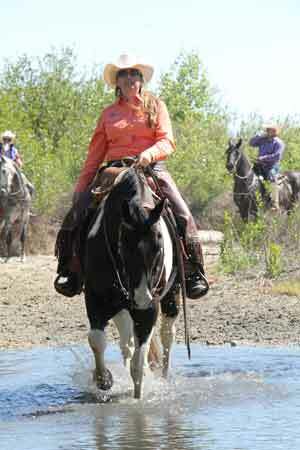 Learn how you can ride your horse with confidence!